After my experience in Abidjan, I was desperately looking forward to getting out of French West Africa and back into some semblance of western civilization. Cape Verde, another Portuguese influenced island nation, was my next stop on the way back to the western hemisphere. My Oct. 20th flight to Sal took 10 hours, as I elected to skirt around the coast of the continent rather than cut across directly, costing me hundreds of extra miles. This route is pretty much standard procedure now for light aircraft, given the political and military instability of Liberia and Sierra Leone, two of the countries that would otherwise need to be overflown. Those governments, like those of Angola, Congo, and Zaire, are all quite cooperative, and in fact each will be happy to issue an overflight permit (for a stiff price) to anyone for the asking. The problem, as in the other southern African countries mentioned, is the almost arbitrary attacks made on low flying aircraft by various insurgents, terrorist groups, and just plain misfits. An informally written, yet widely distributed and highly respected operating manual for professional ferry pilots even contains the admonition "don't fly low over sub-Saharan Africa, or you might get shot at." The grammar may not be the best, but the point is well taken! The course I actually flew was just a few miles offshore, safely out of the range of small arms fire, but still within the controlled airspace boundaries of these countries. Thus, I still spoke with the local air traffic controllers along the way. They varied in their professionalism and usefulness. On the one hand, the Senegalese controller from Dakar was very helpful, asking (like the East African controllers had done for me two weeks earlier) for frequent "ops normal" radio calls so he could be sure I was doing OK. On the other hand, the Liberian controller from Roberts Airport only wanted to know one thing from me: my billing address. Whether I lived, died, or performed aerobatics over his airport didn't matter to him, so long as he could count on collecting his overflight fee! Cape Verde was not at all what I expected. But, come to think of it, I don't know what I really did expect, save maybe another tropical paradise. Anyway, that it wasn't. The island of Sal is tiny, only a few miles in diameter, and it supports a population of only about 6,000 mixed race people. Sal is truly a "desert" island. Like Walvis Bay, there was nothing but sand everywhere. Very little vegetation was evident, and the few scrub trees that managed to survive were literally bent over at permanent angles, due to the year round constant driving winds. If there was ever a place that you could get a good return on your investment in a wind generator for your house, this is it . . . and I did see a couple of them. My hotel was a very nice, friendly beach resort, entirely populated by European vacationers, mostly Portuguese. Guests at the resort ate meals en masse together, with a singer/DJ playing Latin music and leading various frolicking games and activities. Not speaking the language was a real handicap for me, as it was obvious that everyone else was having a great time (at least it looked that way, but I couldn't understand what they were having a great time about!). As explained above, I detoured around the southwestern coast of Sub-Saharan Africa as I flew toward Sal. Once past Senegal, I angled directly toward the Cape Verde Islands. 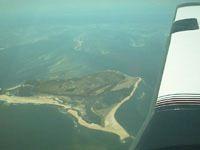 This was my last glimpse of the African continent during the trip, a small island off the coast of Senegal. My hotel in the town of Santa Maria, on Cape Verde's island of Sal. This view from my second floor balcony shows the layout of the sprawling, Latin style resort, which stretched all the way from the inland desert to the Atlantic beach. The resort was completely self contained, with its own restaurants, shops, fitness center, movie theater and swimming pools, literally an oasis on this desert isle. Guests and staff played together and ate meals together, all in a very friendly and informal manner. A great time was had by all! 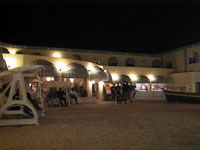 A nighttime view of the main courtyard in the resort complex. 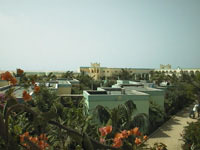 While luxurious by most standards, the resort was still subject to the vagaries imposed upon it by the limited local governmental infrastructure. After all, the entire island of Sal only has 6,000 residents, and they must contend with nonstop winds, rains that are few and far between, and basically a desert environment. 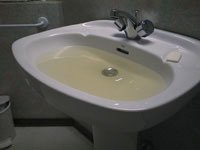 Part of the resulting price is a compromise in water quality. This is what the water looked like when I filled my bathroom sink. It was positively yellow with dirt. Bottled mineral water was not surprisingly very popular at the resort! 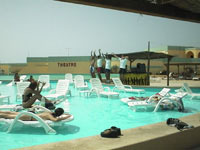 The staff of the Cape Verde resort putting on an impromptu poolside stage performance for guests. What these young performers lacked in musical talent they more than made up for in fun-loving spirit and enthusiasm! A novel poolside game. Two play at a time. A small drinking glass is half filled with water, then floated inside a water filled bucket. One at a time the two players each pour a few additional drops of water into the floating glass, making it sink a little lower with each such successive increase in its weight. Eventually the glass succumbs to a final drop of water, sinking to the bottom of the bucket. The player who puts in that last fateful drop is dubbed the loser. There were no prizes given to the victors, just a lot of good natured ribbing for the unfortunate losers. Getting dunked into the pool was a significant risk for those with a poor estimation of the incremental weight of each water drop! A very representative view of Sal from the taxi on the way back to the airport. 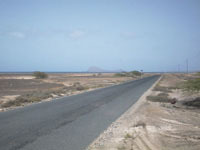 The whole island has this desolate look, with only the shoreline resorts offering artificial escapes from the desert monotony. 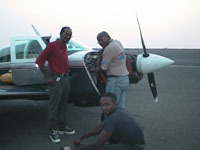 By the time I had reached Cape Verde, the Mooney desperately needed another oil change. The last time this was done was in Zimbabwe, almost 40 hard flight hours earlier. In the interim it had flown through very hot and dusty African desert air, taxing the capabilities of the engine's air filter and oil cooler, running the oil temperature up close to red line values, and thereby rendering the viscosity promoting poloxymers in the multi-viscosity oil all but ineffective by that time in its life cycle. Further extensive flight without new oil could be damaging to the engine, although the extent of such under-lubrication damage couldn't really be accurately predicted. I therefore insisted on an oil change at Sal, regardless of the hurdles. And hurdles there were! For one thing, there were no hangars at Sal at all, so the work would have to be done outside in the blowing dust and sand. Second, the few mechanics located at Sal all worked for the Cape Verde airline, which flew only turboprops and a single Boeing 757, and thus none of them had the slightest idea what to do with a little 200 horsepower piston engine. In the end, I had to fall back on the "crash" course in engine maintenance I had received from Bill Leahy's team in Hayward, CA over eight weeks and three quarters of a world earlier. I supervised the undertaking myself. The Sal mechanics were as helpful as their limited facilities, training, and tools could allow, but they didn't even have the simple torque wrench that was needed to properly tighten the replacement oil filter. Thank goodness for Bill Leahy! Since Bill had trained many missionary pilots for bush operations, he had shown me how to compensate for just this problem, using a "Leahy Rule of Thumb" for the amount of tightening to apply. Accolades also go to Ian, at Ian Aviation back in Brisbane, who had insisted that I carry with me on board a generous amount of new oil and a stock of oil filters before I entered the Third World. 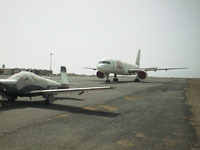 By the time the Mooney took off from Cape Verde, all of these critical supplies had been exhausted. Multi-viscosity oil and replacements for remotely mounted oil filters are simply not available in the tropics. Local operators never have to contend with cold temperatures, so they simply use cheap, heavy weight, single viscosity oils, and they employ reusable oil screens in place of the expensive, disposable filters that predominate in Western countries. This would be oil change number six of the grand voyage. A nice new B-757 airliner parked on the ramp behind the Mooney at Sal. I saw examples of this rather ludicrous situation throughout the Third World. . .tiny countries buying and supporting airplanes costing tens of millions of dollars, all in the interest of national "flag carrier" prestige. Other airlines offer regular passenger service to Cape Verde, ranging from TAP Air Portugal to Russia's Aeroflot, so ownership of this Boeing is arguably an impractical and unjustifiable nod to national pride. The mechanics who helped me change my oil were responsible for the maintenance of this behemoth, and it was from them that I learned that the big jet only flies twice a week. Talk about poor asset utilization! The Seychelles Islands, whose total population is just under 130,000, also boasts a shiny new B-767 jumbo jet on it's tiny flag carrier's asset list. Such frivolities seem difficult to explain, at least from the standpoint of Western commercial standards.